The Mona Lisa is the seventh and longest short story in Halo: Evolutions - Essential Tales of the Halo Universe. It follows the crew of the UNSC Red Horse as they are sent to investigate the fate of the prison ship Mona Lisa, which has mysteriously come to rest near the destroyed Installation 04. After boarding the ship, a team of Marines stumbles upon a parasitic nightmare, and begin a desperate struggle for survival against the parasite. The Mona Lisa was written by Tessa Kum and Jeff VanderMeer. Like three other Halo: Evolutions stories, The Mona Lisa has been adapted to a motion comic by ONE. Aboard the UNSC Red Horse close to the wreckage of Alpha Halo, a team of Marines and naval personnel led by Sergeant Zhao Heng Lopez recovers an escape pod from the Mona Lisa. Inside the pod is a critically injured man who says little but to express his relief at being safe before expiring. Sergeant Lopez is summoned to meet with the CO of the Red Horse, Commander Tobias Foucault, and the new AI, Rebecca. Lopez is ordered to take her team and investigate the Mona Lisa, although exactly what she is supposed to be looking for is left unclear. Lopez realizes that her team consists of everyone who has come into contact with the John Doe inside the escape pod. These include Ngoc Benti, a corpsman, Clarence, an extremely competent and quiet Marine, MacCraw, the loud and inexperienced rookie in their squad, and Burgundy, a crack Pelican pilot. The Marines inspecting the escape pod. Lopez's squad boards the drifting Mona Lisa and quickly cleans up a small group of unarmed, unarmored Covenant Sangheili. Benti, chasing a Sangheili, runs almost directly into it. The alien, to Benti's surprise, puts its finger to its mouth in a "shush" gesture. Benti hesitates, and the Sangheili is gunned down by Clarence. After they finish killing the few Covenant in the area, one of the Marines, Rabbit, goes missing. Lopez assigns a small group of Marines to stay behind and guard the Pelican while the rest look for their missing squadmate. 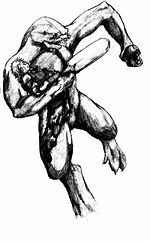 The lost Marine is soon found dead with another unarmed Sangheili repeatedly stomping on her chest. While removing Rabbit's dog tags, Lopez notices unnatural growth on the body. At the same time, the Marines left to guard the Pelican; Cranker, Simmons, Maller and Sydney, engage an unseen enemy, and are quickly overrun. Burgundy stays inside the Pelican and watches as their bodies disappear. The remaining Marines make contact with Foucault, who orders them to initiate the Cole Protocol, seeing as there are loose Covenant on the ship, and erase the ship's navigation data. Lopez divides up her remaining men into two groups, one led by herself to destroy the nav data in the bridge and the other led by Benti to destroy the backup in the engine room. As Benti's team leaves, Lopez realizes that another Marine, Ayad, is also mysteriously missing. Lopez and her squad make their way to the ship's minimal medical bay. There, they find a sealed safe room, and it opens to reveal the ship's supposed medical officer, John Smith. After encountering a strange growth within the ship, Lopez verbally interrogates Smith, who reluctantly reveals that experiments were being conducted on Covenant prisoners with an unknown infection, but then the infection jumped to the human prisoners aboard the ship. Burgundy sees Cranker and Maller outside, badly wounded but apparently still alive, and opens the Pelican for them to get in. Up close, Burgundy realizes that the Marines are in fact dead and deformed, yet are still walking, and attempts to stop them from getting to her. She is overpowered and dragged away. Meanwhile, Benti's group makes its way into the bilges of the ship but is soon engaged by a group of the Flood. As the Marines make their escape, Orlav is wounded, expires and later wakes up to bite another Marine, Gersten. Lopez loses another man, Rakesh, to the Flood, and eventually finds that Smith is actually an ONI operative. Killing Mahmoud with a concealed knife, Smith breaks free from Lopez and makes it back to the Red Horse in the Marines' Pelican. Benti finds a human survivor, a prisoner named Patrick Rimmer, and a befriended Sangheili armed with a cricket bat Rimmer has dubbed "Henry". Rimmer points out that one of Benti's party is infected. The infected Marine, Gersten, is promptly shot in the head by Clarence, reanimates and is shot again. During an engagement with an infected Sangheili, Lopez's group loses two more Marines, Singh and Percy, leaving only herself and MacCraw. On the bridge of the Mona Lisa, Lopez makes contact with the Red Horse one last time, and she is informed that Foucault will destroy the Mona Lisa to ensure that the Flood do not escape. Benti's team, now only consisting of herself, Clarence, Rimmer and "Henry", finally reaches the engine room and witnesses Burgundy being dragged to a huge growth on the engine. Realizing that the Flood are trying to "hot wire" the slipspace drive to work, Benti throws her last grenades at the Flood growth to destroy it, and begins to fall back. They meet up with Lopez and MacCraw outside the airlock for the escape pods, but Benti is injured by an infected Marine. When Lopez sees "Henry" and Rimmer, Clarence shoots Rimmer in the head and is revealed to also be an ONI agent. As the survivors standoff, MacCraw takes one of the two remaining escape pods and abandons them. The wounded Benti manages to push Clarence into the army of Flood pursuing them, and both of them are taken. Lopez and "Henry" hold off the Flood long enough to enter the airlock, but then they realize that there is only enough room for one in the remaining escape pod. Lopez tries to shoot "Henry", but realizes she is out of ammunition. The two begin fighting for the last pod as the countdown timer to Foucault's attack reaches thirty seconds. A scene from the last episode of the motion comic adaptation, with Henry carrying Benti. Note the similarity to the fan-made cover. Several elements present in the short story have been omitted from the motion comic adaptation, including a number of secondary characters (Ayad, Maller, Percy, Rakesh, Simmons and Sydney). A recurring motif in the story, with the characters making frequent references to ice cream, is not present either; in two lines in the final episode of the motion comic, "ice cream" is replaced by "shore leave". In addition, Rebecca only appears in her "warrior" avatar while in the original story, she alternates between two avatars. When writing the story, Tessa Kum and Jeff VanderMeer used Halopedia for some of the story's in-universe details, as they were not given access to the official Halo Story Bible. In the motion comic adaptation, Threshold is depicted as being blue, while all other appearances depict it as somewhere between purple and orange depending on its position relative to Soell. The animators may have confused the planet with Substance, the blue gas giant which Installation 05 orbits. The famous Wilhelm Scream is heard in Part 9 of the motion comic adaptation, in the scene where Foucault is watching a recording of a Marine being attacked by the Flood. Logo used for The Mona Lisa motion comic.